Shrimp with lemon, parsley, and garlic echoes classic shrimp scampi, but here it's a cooling salad. Prep and Cook Time: 25 minutes. Notes: Prep the cups up to 1 hour ahead; assemble just before serving. They're juicy, so serve with napkins. In a bowl, whisk together the olive oil, lemon juice, parsley, capers, and garlic. Add shrimp and season with salt and pepper to taste. Cut the cucumbers into 18 3/4-inch slices. With a melon baller or small spoon, scrape out about half the flesh from the center of each slice. 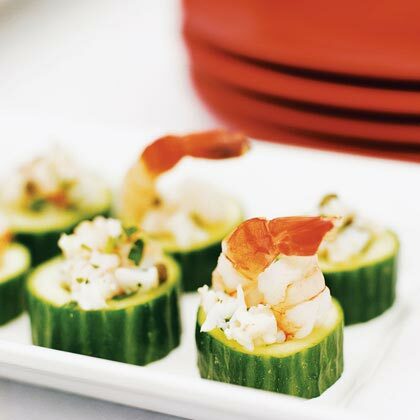 Fill each cup with shrimp salad, or, for an even prettier presentation, place a whole shrimp upside down into about half the cucumber cups, then spoon the salad around it.